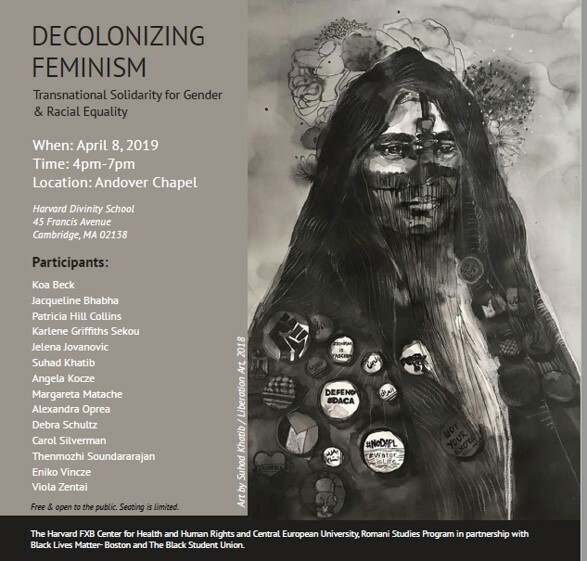 On April 8, the Harvard FXB Center for Health and Human Rights and the Romani Studies Program of the Central European University will organize a panel discussion entitled Decolonizing Feminism. Transnational Solidarity for Gender and Racial Equality, which will center the issue of global solidarities among women of color. Patricia Hill Collins, a celebrated social theorist and the author of “Black Feminist Thought: Knowledge, Consciousness, and the Politics of Empowerment” will participate in a conversation with African American, Dalit, Palestinian, and Romani feminist scholars and activists. The panel is organized in partnership with Black Lives Matter, Boston; and the Black Student Union. We are also very grateful for the kind support of Harvard Divinity School’s Harambee Students of African Descent, the Religious Studies Department, and Professor Amy Hollywood. The struggles of African American, Dalit, Palestinian, and Romani women have many parallels. From past sufferings to a continuum of racialized and gendered oppression, they are victims of similar systems of unjust patriarchy, dogmas, policies, laws, and actions. Yet, social movements continue to isolate their struggles versus building upon the power of global shared experiences. This panel discussion will focus on the connection of struggles, political tactics, and paths, examining how to build momentum for a joint global solidarity movement against oppression in which women of color are at the frontier. We aim to discuss and create solidarity among racialized women across the world by using the struggles of African American, Dalit, Palestinian, and Romani women as focal points for more general inquiry and discussion. We also seek to harness reciprocal support, learning, and cooperation from intersectional feminists across different geographies and social movements. For inquiries, contact Margareta Matache, instructor, Harvard FXB Center, and director of the Roma Program at Harvard. Email: mmatache@hsph.harvard.edu. We will be live streaming the conference on the Harvard FXB Center’s Facebook page, so check in there if you cannot attend. Please note that the event is free and open to the public, however, seating is limited.